EDSON ZAMPRONHA (Rio de Janeiro) has received two outstanding awards from the São Paulo Association of Art Criticism (Brazil) and he won the 6th Sergio Motta Award, the most outstanding prize on Art and Technology in Brazil for the sound installation Poetic Attractor, created with the SCIArts Group. His works offer a super expressivity in the scene of advanced classical music: a new perspective that opens original paths for music experience and sound exploration, linked with a convincing communication with the audience. One of the most original composers of our time - Bravo! Review (São Paulo, Brazil). 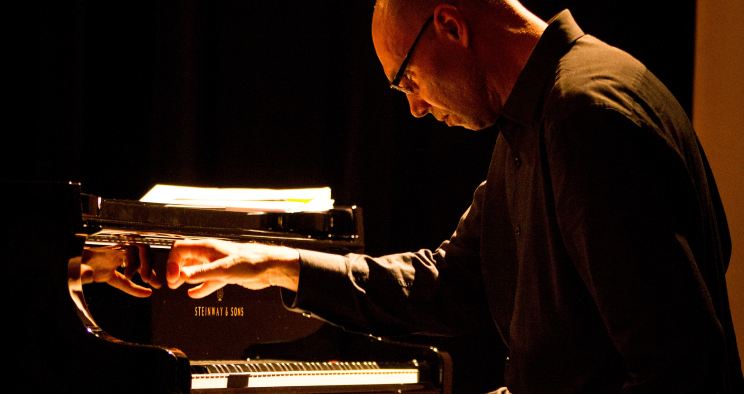 He has received commissions from different groups and institutions, as from the Museum for the Applied Arts in Cologne (Germany); from the São Paulo Symphonic Orchestra Foundation – OSESP (Brazil), from the Mexican Center for Music and Sound Arts – CMMAS, and from de XXI Biennial for the Brazilian Contemporary Music – FUNARTE. His works have been performed in outstanding concert rooms, as at the Auditorio 400 – Museo Nacional Centro de Arte Reina Sofía in Madrid; at the CBSO Centre in Birmingham – England, and at the Sala São Paulo, Brazil. His compositions are included in three CDs fully dedicated to his works (Sensibile, Modelagens and S’io Esca Vivo) and in other fifteen CDs released by different record labels and institutions. His catalog includes more than 100 works for orchestra, symphonic band, opera, choir, ballet, theater, sound installation, electroacoustic music, chamber music and film. The work of Zampronha has gone beyond the specialist circle and he has conquered spaces and audiences never known by the classical composers - Concerto Review (São Paulo, Brazil). He is the author of the book Notation, Representation and Composition – a new paradigm in musical writing (in Portuguese) and he has organized five other books. He has more than 30 papers published. He has a Ph.D. in Communication and Semiotics – Music – by the Pontifical Catholic University of São Paulo and he has developed a Post-Doctorate research on Music at the University of Helsinki (Finland). Furthermore, he is in possession of a Master in Composition by the Federal University of Rio de Janeiro and is graduated in Composition and Conducting by the São Paulo State University. One of the main composers of the new generation of classical composers from Brazil - O Estado de São Paulo (Brazil). He is a Professor at the University of Oviedo, Spain. He has also collaborated with the Valentian International University, Spain (Consulting Professor); the University of Valladolid, Spain (Visiting Professor) and the Higher Conservatory of Music of Asturias (Senior Professor). He is a former Professor(tenure) at the São Paulo State University, Brazil.